Prevents Surface Damage - Safe For All Surfaces. 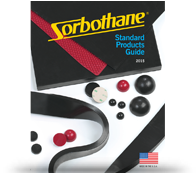 The Sorbothane® SOFT-BLOW MALLET is made from a unique visco-elastic polymer that is recognized worldwide as the ultimate material for absorbing shock and isolating vibration. Available in three sizes - the SOFT-BLOW MALLET provides maximum surface contact without denting or marring. Safe for use on wood, metal, vinyl, tile, glass and plastic.